The Farquhar College of Arts and Sciences welcomed acclaimed novelist Edwidge Danticat as the first guest of the college's 2010-2011 Distinguished Speakers Series. The Haitian-American author was the keynote speaker at Nova Southeastern University's 2010 Convocation ceremony, an annual gathering of the campus community to mark the beginning of the undergraduate academic year. Known for her eloquent and insightful depictions of Haiti and its people, including The Farming of Bones and Krik? Krak!, Danticat was born in Port-au-Prince, Haiti, in January 1969. Her father moved to the United States when she was two years old, followed by her mother two years later. Danticat and her brother stayed behind, living with their uncle, a minister. 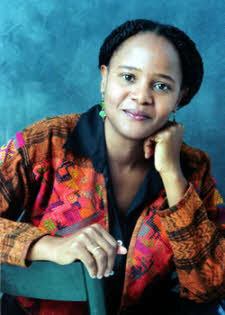 Danticat began writing short stories in Haiti before moving to the United States at age 12 to join her parents. Living in Brooklyn, New York, she learned English and began writing for her high school newspaper. One of those articles, about her reunion with her mother, was later the basis for her master's thesis and her book Breath, Eyes, Memory. Danticat received a Bachelor of Arts degree from Barnard College in 1990 and a Master of Fine Arts degree in 1993 from Brown University, where she was awarded a full scholarship for the creative writing program. Her books include The Farming of Bones; Breath, Eyes, Memory; The Dew Breaker; and Krik? Krak!, a collection of short stories. More recently, she penned Brother, I'm Dying, which recounts the triumphs and tragedies of her father and uncle in Haiti and the United States. The Farming of Bones, published in 1999, recounts the story of the 1937 massacre of Haitian workers in the Dominican Republic, as seen through the eyes of a young domestic servant. The book was the focus of the college's First-Year Reading Program for the 2010-2011 academic year. Student participants each received a free copy of the book and engaged in small reading groups, giving them the opportunity to discuss the book with their peers and college faculty members. Danticat also is the editor of The Butterfly's Way: Voices from the Haitian Dyaspora in the United States and The Beacon Best of 2000: Great Writing by Women and Men of All Colors and Cultures. She has been a visiting professor of creative writing at New York University and at the University of Miami. In 2009, Danticat became a recipient of the prestigious John D. and Catherine T. MacArthur Foundation's "Genius Award" fellowship. This $500,000 "no-strings-attached" fellowship is awarded to "talented individuals who have shown extraordinary originality and dedication in their creative pursuits and a marked capacity for self-direction." Danticat has also been a finalist for the National Book Award and the PEN/Faulkner Award. She is the winner of an American Book Award and the National Book Critics Circle Award. In 2005, she was awarded the first Story Prize for short fiction for her novel The Dew Breaker. Danticat, 41, lives in Miami, Florida, with her husband and daughters. As part of the college mission to prepare students for rich professional careers and active citizenship, the college frames co-curricular programs and experiences around a broad annual theme that unites our community in interdisciplinary exploration. The academic theme for the 2010-2011 school year was "Identity." Danticat was the first of the distinguished speakers for the year to address this theme.